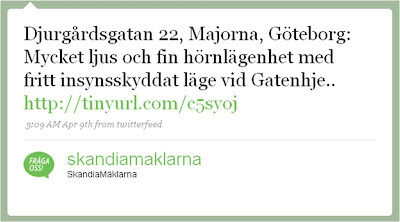 Twitter going mainstream part 567 - Swedish Estate Agent, Skandiamaklarna using Twitter to promote real estate listings! Want to spend a million on an apartment? It's all in your Twitterfeed! Coldplay join Twitter - more evidence of Twitter going mainstream? 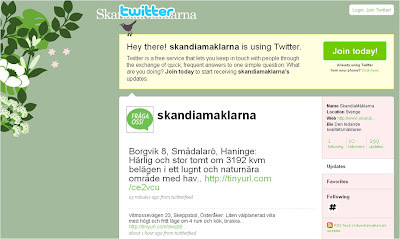 I noticed Skandiamäklarna on Twitter and question the value of a stream of tweets with such variety of offerings. If you search for an apartement, you often have very specific demands in terms of area, size, price etc. This feed includes both apartements and houses from several different cities in different parts of the country. Don't think it will work unless they filter and open different accounts for different cities, for example.